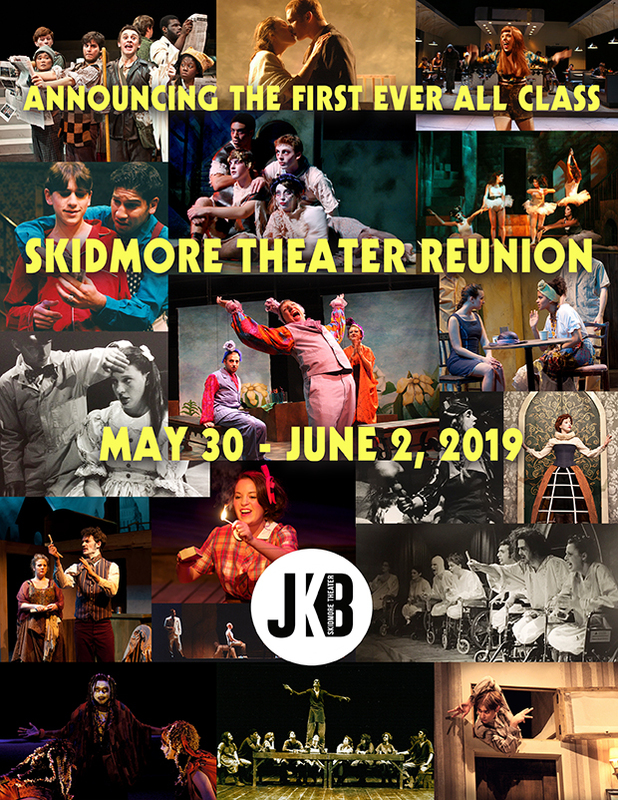 We are thrilled to officially invite you to our first all-class Theater Reunion, which will take place during Skidmore’s Reunion weekend, May 31st – June 2nd, 2019. Please save the date for this special occasion! We have an incredible weekend of activities planned, including an alumni panel, a reception to honor the extraordinary contributions of our Senior faculty, many of whom are rounding out their long careers at Skidmore, a slideshow presentation of the Theater Department ‘Then & Now’, plus some fun activities such as our ever-popular Tech Olympics, a massive outdoor Viewpoints session, and of course a Yucca! We will have plenty of time throughout to eat, drink, and socialize together, on campus and downtown. We all know how special the Skidmore Theater community is. We are so excited to finally get everyone together (under happy circumstances) to connect, catch up, reminisce, and celebrate our unique and wonderful Company. We hope that you will plan to join us at Reunion 2019! This year’s Reunion is for classes ending in 4’s and 9’s (hint to ’99, it’s your 20 year!! ), but the Theater Reunion is for ALL CLASS YEARS, and you do not need to have been a Theater major to attend.